They both depend on the consistent behavior of their leaders for success. Did you watch the US soccer team beat Ghana in the World Cup? It was an exciting game, and the winning goal was scored with only a few minutes left on the clock. When it was over, experts on the TV panel were asked to weigh in on the game. I was impressed to find that rather than focusing on the winning goal, they talked about the leadership of the US coach, Jürgen Klinsmann. Did you catch that? The success of the US team against Ghana in the World Cup was attributed not to any individual player or the game-winning goal; rather, it was attributed to consistency. Consistency is one of the most important leadership behaviors that a person can learn. This trait is what makes the difference between successful leaders of productive teams and those who fail to lead struggling teams. Consistently teach, guide, and mentor the team. Your role as a leader includes helping your team to grow both as individuals and as a unit. Making sure that you show them all day, every day, that you are here to help gives them the confidence in you that they’ll need in order to come to you for help when they need it. Consistency in this behavior shows them that you mean it when you say you’re available to help, and they’ll trust that they can depend on you as they seek to continuously improve your organization. Whether you’re promoting the strengths of team members who are performing exceptionally well or encouraging those who are struggling to do better, it’s important to your employees that you consistently acknowledge their efforts. Often, they may feel as if they’re going out on a limb when they suggest and implement opportunities for improvement. If they know that they can depend on you to consistently provide honest feedback, they’ll be much more comfortable contributing to your culture of continuous improvement. You don’t want your team to be second guessing your every move, motive, or intention. A team that walks on thin ice isn’t going to move far or fast; provide them with a predictable, stable platform from which to base their continuous improvement efforts. People inherently want to succeed, so make it easy for them to know what success looks like to you. Identify your goals in advance so that the team can continuously improve to meet those goals. 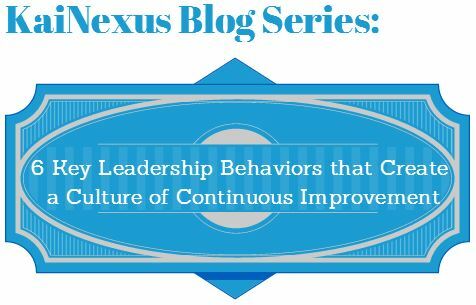 Consistent leadership behavior results in consistent team performance, and helps create a solid foundation for continuous improvement. Join the conversation: Leave a comment and tell us about what you keep consistent that helps you lead your team! This post is the fifth in a seven part blog series. Be sure to sign up to receive posts via email so that you don't miss the rest of the series (or any of our other posts)! What leadership traits should you be focusing on? Download our free eBook to find out!